In this innovative and engaging text, Vivian Maria Vasquez draws on her own classroom experience to demonstrate how issues raised from everyday conversations with pre-kindergarten children can be used to create an integrated critical literacy curriculum over the course of one school year. The strategies presented are solidly grounded in relevant theory and research. The author describes how she and her students negotiated a critical literacy curriculum; shows how they dealt with particular social and cultural issues and themes; and shares the insights she gained as she attempted to understand what it means to frame ones teaching from a critical literacy perspective. New section: "Getting Beyond Prescriptive Curricula, the Mandated Curriculum, and Core Standards"
New Appendices: "Resources for Negotiating Critical Literacies" and "Alternate Possibilities for Conducting an Audit Trail"
"In the tenth anniversary edition of Negotiating Critical Literacies with Young Children, Vasquez (American Univ.) provides a brief description of critical literacy and its use in a primary grade classroom…She also explains how she guided the students' further inquiry into a topic and how they collectively worked through problems. Summing Up: Recommended." "Through vibrant, memorable, and surprising examples of very young children grappling with very real social issues, Vivian Vasquez has transformed critical literacy in early childhood education." "These amazing accounts, supplemented with advice for implementing critical literacy practices with young children, will inspire many teachers to explore the potential of their students’ voices and the power of young children to work for change in their schools and communities." 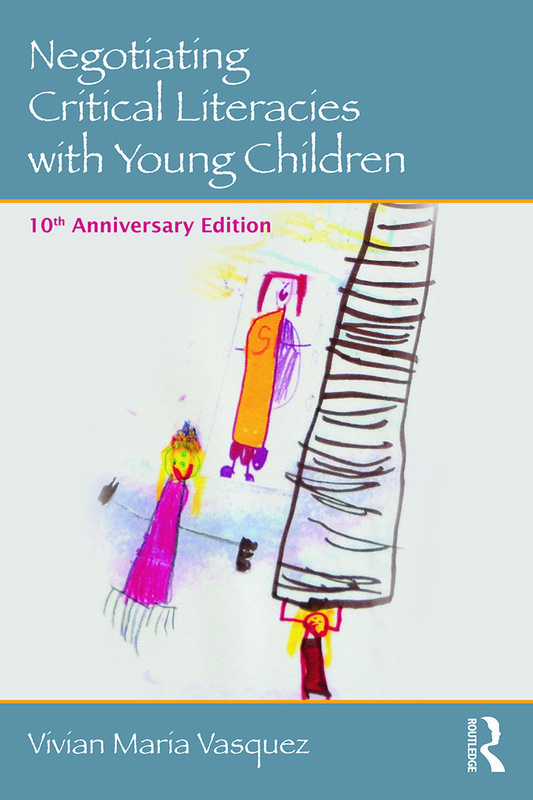 "Too often teachers of young children doubt their students’ capabilities for engaging in deeply analytical understandings of a variety of texts, but Vasquez’ book provides sound critical theory and an abundance of practical examples of young children asking sophisticated questions about the texts of their lives, from McDonald’s to TV to their own school community. After reading this text, never more will these teachers have doubts." "We desperately need critical literacy approaches at all levels of schooling, and especially at the pre-school level. Negotiating Critical Literacies with Young Children is a brilliant, essential, uplifting, and inspiring book nee3ded more now than ever." "The critical and creative ways of being in Vivian’s preschool classroom should be a model of living and learning for all of us. This is education at its best – and anyone involved in early childhood initiatives or policy-making that will impact the lives of children and their teachers should take time to read this before putting mandates in place." "Dr. Vasquez is one of the most reflective and committed scholars in the field of critical literacy, social justice and early childhood education. She is a pioneer in developing and sharing how to develop critical classroom practices. In this revised edition she shows one more time her ability to develop accessible and sophisticated ideas to educators." "A concise and practical book that opens up doors for pedagogical possibilities in literacy classrooms. Any educator interested in building students’ critical literacy skills can draw on Vasquez’s range of examples – and key moments in the learning process through an audit trail!" "Vivian Vasquez’s groundbreaking work challenges educators to think more expansively about young children’s critical inquiries. It is essential reading for early childhood literacy teachers and scholars." "Vasquez eloquently describes how teaching young children to read is more than a progression of reading skills. By taking readers through the audit trails she illustrates how the ‘teaching of reading’ cannot be isolated from the ‘teaching of critical thinking.’ This book is a cornerstone book for educators who work with young children." Bobbie Kabuto, Queens College, City University of New York, USA. Vivian Maria Vasquez is Professor, American University, School of Education, Teaching and Health, USA.